The swimming pool at the Hotel Kastel at the very top of the hill in Motovun, Croatia is glassed-in and bright in the morning with the green of the garden just beyond the windows. Pieces of the original medieval stone have been used in the construction and you will see them—a stone beam here or there, the outline of an old window—as you float from one end to the other, disrupting the surface at the same sleepy pace as the stone water spigots, which pour into the far end. I fall in love with it instantly, literally at first glance, standing there in jeans and sneakers as we are given a tour of the hotel’s basic but inviting wellness facilities. I think, I must swim in that pool. And I do. I wake up early the next morning when I don’t need to. And even as my eyes open to watery sunshine, to the view across Istria’s rolling hills, I know exactly how I want the day to be. I want to think about and do nothing difficult. It’s my last morning in Istria. All I want is to float. I take the glass elevator downstairs wearing a cotton dress and leggings, the comfort food of my wardrobe, and hope that being an early bird will payoff. It does. In the off-season, in spring, at that hour of the morning, I enter the pool and I am blissfully alone. The spigots haven’t even been turned on, so the surface is an unbroken blue sheet and the room is silent, the air still and softly humid. I think to ask the spa technician if it’s OK to swim, but I can’t find her, not that I try very hard. A white board on one wall lists the water temperature and pH and I consider this an official invitation. I change, dropping my stuff in a locker. I break that perfect surface. I am empty-headed, toes above the surface, doing easy laps. This is more or less my favorite thing to do on earth. The jacuzzi seems like a great idea until I slide into the curve of blue tile at one end of the pool and press the button and my calm surface erupts into spurts of foam and bubbles and the silence dies, chased away by the hum of the hum of the motor. I want it to stop immediately, annoyed with myself. I swim away from it as though it were a bratty kid splashing and screaming in the shallow end, hoping that it will stop. After what seems like an eternity of gurgling and humming, it does, and my peace comes back. The laps continue. I am suitably solitary, prune-y at the fingertips, on vacation. Travel provided by the tourism board of Istria, Croatia. The theme of the trip is pigs. For the flu, maybe, which is on every television screen we pass. But mostly for the ones on the agritourism farm in Istria, Croatia, which we visit on a day full of cloudy skies and cold rain. A day on which we are supposed to hunt for truffles on the same farm, but because of the rain, we don’t. On this day, the truffle dogs shift in their houses, poking their heads out, restless, while the house dog barks—a yipping little thing with stickup hair—at our shifting ankles, mocking our poor thwarted plans. The farm is called Agriturismo Toncic, and you need a car to get there from Pula or from Rovinj, but I would say that it makes a car worth getting, even in the rain. If you can drive one, which I can’t. But on this particular day, I am happy for company and a van that is driven by someone who understands the street signs, who is not me. I am happy just to go. But thankfully for us, this farm does more than truffles. Probably, given the finicky nature of truffles, thankfully for them, too. We see the prosciutto first, moldy and pungent-smelling on hooks in a cool back room that also contains glimmering aluminum wine tanks. The legs are beautiful, seasoned with nothing but pepper, drying in the air, less fatty than Italian prosciutto, and just different. Less greasy. Lighter. The farm is family-run, and the son shows us around—first the older legs and then the younger ones in a different room, which hang on the same kinds of hooks, but beside other sausages and pigstuffs. Perched above the door is an animal skull with a delicate rack of antlers. Butchering equipment sits on shelves, at the ready. The son wears bright blue work coveralls that stand out against the colorless day and describes the family business—some olive oil, some wine, some prosciutto—in a way that makes it seem humdrum and everyday, but all of us city folk drool, a little bit, envious. We want farms. We want to know where everything goes. I put up my hand. Ask a Dumb Tourist question. The son laughs. They use everything. 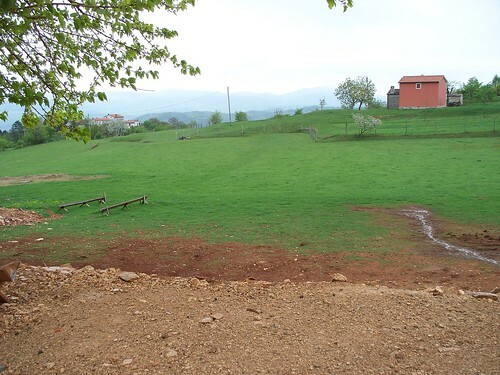 Even on a rainy day, the land surrounding the tiny farm is a blinding green, the buildings red and white. They take us out to show us the pigs. Someone in our party even suggests that they be given toys—something, anything—to give them a quality of life. And I almost see what she means, admiring their alert eyes, their splendid color. (It is a creamy, uniform kind of pink. Like Pepto Bismol.) But these are prosciutto pigs. And, to continue with our piggy theme, if you’re going to eat the prosciutto, you should see the thing that it comes from, look it in the eye. We are then ushered inside to a dining room filled with long wooden tables and a tiled fireplace on one side. Someone has built a fire and we fight for the spots in front of it, holding our chilly hands up. Dinner is served by the daughter and cooked with the mother, who remains in the kitchen for the duration of our visit. But this is how it goes in every place we visit. Mom in the kitchen. Dad in the fishing boat. Son with the butcher knife. Daughter serving, explaining, cleaning, welcoming. It’s cozy at the table, the bunch of us in front of the fire. The dinner starts with the family’s wine, the same stuff in the tanks outside. Before dinner is served, Kerrin sneaks off into the kitchen to say hello to Mamma, to snap photos of the magic behind the scenes. She comes out with a satisfied smile, holding a basket of sooty black truffles, one of them halved to reveal its pure white core. These aren’t white truffles, which are extraordinarily valuable, but they are beautiful and still costly. We are promised truffles with our meal—and we get them. Lunch is noodles with shaved black truffles and ravioli with two kinds of cheese—one cow, one sheep—with the delicately flavored spring asparagus that’s in season. The main dish is roasted lamb, pungent with olive oil and spices, roasted potatoes, and a light salad. We groan under the weight of it, silent except for the sound of our munching. And there is, of course, dessert too. A sugar-sprinkled cookie with a hole in the center. Another cookie, a coiled spiral of dough with cinnamon. And a cake with a cream layer. We are told afterwards that there is accommodation available too. That you can sleep, eat, hunt for truffles, all for not very much money. All in one place, against green rolling hills and amidst little medieval towns and the yelps of the truffle dogs. And really, what you can see is how a family lives, how food grows, and how your vacation is really just a glimpse into a system that works. A system that’s always there, whether it’s on a farm in Istria, Croatia, or one in your town or state. And if you go to relax or to eat or to hunt for those elusive truffles, you will be able to draw the line. Pig. Prosciutto. Dinner. Food. Sustenance. Livelihood. I want to live in a walled Medieval town on the top of a hill, one that is surrounded by vineyards and green fields and the occasional dot of a house or a farm in every direction. I want to catch myself from slipping on the white limestone cobbles and I want to sit under a tree in the square near the old cistern—it still bears the symbol of the State, winged lions in flight—that’s been capped so kids don’t fall into it and kill themselves, and read a book under a tree all afternoon. 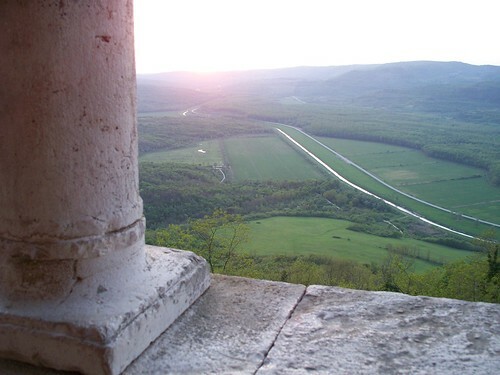 I want to wear a blue flowered sun dress and when the sun shifts too far in the afternoon, I want to pace on the stone walkway between the inner and outer fortifications, perched above that view of the fields and the vineyards and the river cutting across them, and I want to think of things to write. And then I want to go home to my room and write them. I feel like, if this could come true, if I could spend the rest of my life in town like Motovun, which is real, which I can see out my window right now—that same view but in darkness, the single houses and farms below just flickering lights in the distance—it might spell that perfect thing we all see in our heads. The Thing That Would Make Me Happy, if any such thing could exist for anyone. Why, I would read books. And I would write them. Motovun is like other kinds of towns in other places. There are breathtaking hilltop towns in France and Italy and Germany, their details all subtly different—the cistern in a different place, a different kind of steeple on the church—but they are the kinds of towns that spin me like a top, that make my fingertips buzz as I touch their centuries-old stone, walk their streets that are sloping and shifting with the ages, molding to the shape of the mountain underneath them. What makes it special, though, is that its most famous inhabitants were Venetian, allowing the city some of the beautiful flourishes that are mostly seen drooping over canals at almost-sub-sea level. Even the air feels cleaner up here, and I say that as someone who frowns at the notion of clearly preceptible differences in air quality between downtown Manhattan and an outcropping of rock in the center of northern Croatia. I know that the differences must exist, but to complain about them seems like a colossal misuse of time and energy. But standing here, watching the cats that belong to no one dart from one stoop to the other, I can’t help but wonder. What I could do with real time. Real quiet. Real space. While knowing that I would waste a lot of it, and not-write with a lot of it, and sit around worrying that the world was passing me by, like I did in the first 18 years of my life in a Massachusetts suburb that could seem almost as remote and ungrounded—something floating in its atmosphere—as a village on top of a mountain. So I’ll leave Motovun tomorrow, the square and the cistern, the Venetian lions and flowers in stone, the terrace that overlooks the vineyards, its 300-year-old timbers the newest addition to the town’s architecture. Not because I have to. This is the thing that traveling has taught me. You don’t actually need to go anywhere, to do anything at all. 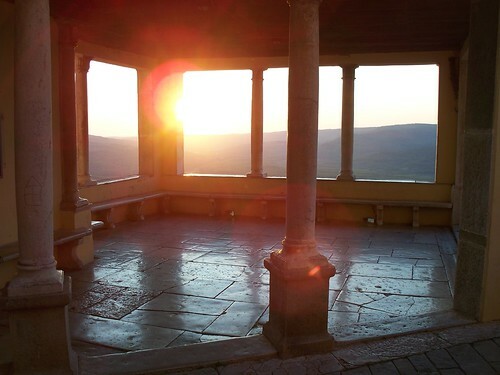 But because Motovun is my happiness in two days, maybe three. In sun only. In a blue sun dress but not a yellow one. In a time where I’m not feeling lonely, when I have unlimited funds in the back. And how often would those things all happen at once? Not just seldom. Not just once a millennia. But never and nowhere, as fleeting as that fairy tale I might get to writing someday.